A couple of solid articles from the June 22 Sports Illustrated that really get into the character of the people covered. 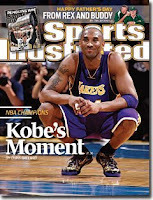 Attached to the cover image, Chris Ballard wrote a piece titled "Satisfaction" about Kobe Bryant's now realized single-minded pursuit of his fourth NBA title. Like him or not, I think it would be an interested read for a lot of sports fans in it's portrayal of one guy's drive. Also from this issue was Tim Layden's story "The Joy of Rex" about New York Jets first-year coach Rex Ryan. What I found interesting about the portrayal of Rex (as well as brother Rob and father Buddy) was their dedication to football, each other and doing the job the way they felt it should be done... even if that ran counter to what others thought. Finally, it's different than the first two pieces noted above, but also bears mentioning a hockey blog post I did on the Penguins Stanley Cup win... an article about which is also linked to from this issue. Yep, a lot of interesting stuff in this one.